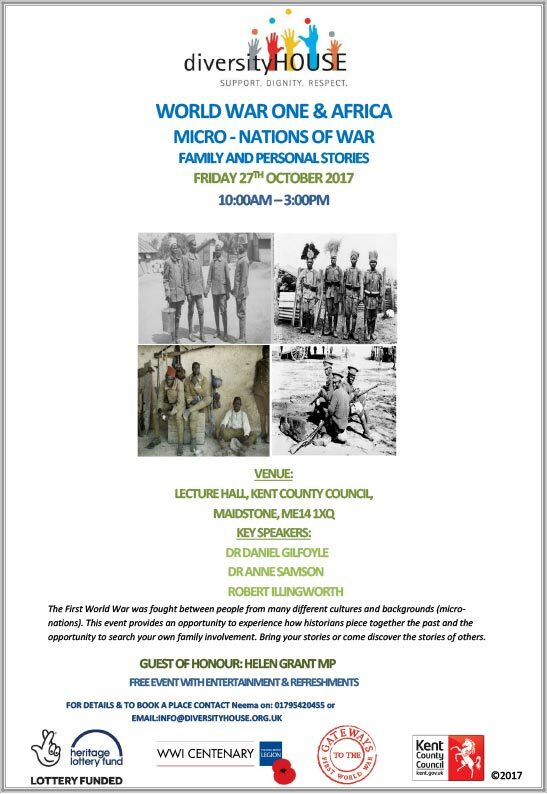 As part of the continuing programme to ‘break the myths’ and raise awareness of the vital contribution of Africa in World War One, Diversity House is delighted to be hosting a workshop on, “World War One & Africa; Micro – Nations of War; Family and Personal Stories’ at Kent County Council in Maidstone on 27th October 2017. (see attached flyer). The aim of the workshop is to encourage participants to research their own personal and family histories to gain hitherto unknown and unrecorded information about the involvement of their own relatives or friends in the African war effort. Dr Anne Samson, an independent historian and expert on the First World War and Africa, Nick Ward and Andrew Fetherstone from the Commonwealth War Graves Commission (CWGC) amongst other notable experts will demonstrate how to investigate historical facts and piece together evidence and anecdotes from the past. As part of the preparations, Diversity House in collaboration with The Royal British Legion is also presenting a workshop at St Michaels School in Maidstone on WW1 & Africa. The programme will explore themes on music, transport, labour and much more to compare the differences between the European and African war efforts. African music and dance group Bantu Arts are included in the programme as well as poetry writing, singing and letter writing to reflect the activities of the soldiers in WW1. A poppy making session to highlight the colours of the different modern- day African flags will also take place. The artwork from the children will be on display during the event on 27th October 2017. Christine Locke, the founder and CEO of Diversity House said “the educational, community and commemoration activities already undertaken will shine a light on Africans in WW1 and dispel the myth that that the war was only fought by white Europeans. This has the aim of improving attitudes and behaviours towards Africans living in Britain today.” ‘World War One & Africa; Micro – Nations of War; Family and Personal Stories’ is the third in a series of conferences under the ‘Breaking the Myths: WW1 and Africa’ project which was launched in January this year and was followed by the ‘WW1 & Africa: Legacies of Conflicts’ at Swale Borough Council in June. The Mayor of Maidstone attended both events and it is hoped that Helen Grant MP will grace her presence as the Special Guest of Honour at the forthcoming event.